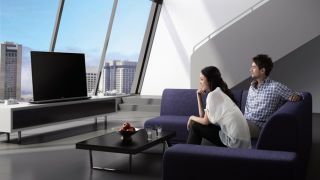 "We didn't appreciate those Bank Holiday deals when we had them"
Samsung and Sony are both starting to set the lowest prices of their televisions in the US to avoid retailers selling them at loss-making prices, according to a new report. The television market has long been struggling against super low pricing which doesn't leave much margin for profit, with many – including Sony – lowering or dropping out of television production altogether. The Wall Street Journal reports that both Samsung and Sony have begun enforcing the new pricing rules last month, although neither has reported what they will do to retailers who flout them, so we can't be sure they won't throw them alive into a piranha infested tank. Probably not though; more likely the tech companies will cut retailers off or stop supporting in-store marketing. But what does it all mean? Well, you may no longer be able to enjoy such bargains as a cheap 42-inch TV over holiday weekends because presumably the pricing rules will apply to sales as well, while the cost of televisions generally may sneak up. There's no word whether this will affect the UK, as the move seems to be just a US-lead thing at the moment. According to the WSJ, the president of Best Buy USA said in an earnings call that this was a move happening more and more by companies. We can't help but wonder if Samsung and Sony have half an eye on Apple and its rumoured iTV plans. After all, you can be sure that if Apple does release an HDTV, the thing will not be cheap.